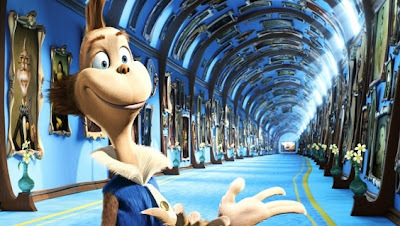 In 2008 with the release of-- what could very well be the most wholly satisfying animated feature of the year-- Dr. Suess' Horton Hears a Who!, Fox's CGI divisional company Blue Sky Studios proudly announced to Pixar and DreamWorks Animation, "WE ARE HERE!" 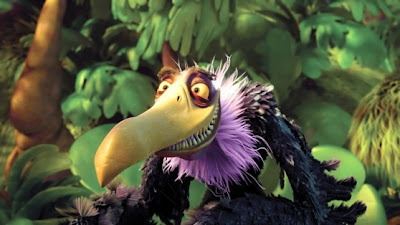 Having already burst onto the scene with Ice Age as well as providing some truly spectacular bits of CGI for our pop culture landscape such as augmenting David Fincher's incredible Fight Club and the memorable "talking fish" episode of The Sopranos, Blue Sky has always been one of the best kept secrets in effects work and computer animation. However, with this tremendous new release of Horton, which-- typical for computer animated works-- stuns in a visually eye-catching transfer to DVD and Blu-ray and in doing so we're actually let behind-the-scenes of the company to see the talented and impossibly young inventors at work. But before I delve into the extra features, here's a reprint of my original theatrical review of Horton. Dr. Suess' Horton Hears a Who! “I meant what I said, and I said what I meant. An elephant’s faithful one hundred percent,” so goes the famous quote from Dr. Seuss’ Horton Hatches the Egg that seems to be even more poignant when scripted for actor Jim Carrey as he lends his vocal talents to bring children’s literature’s best loved elephant to life in Dr. Seuss’ Horton Hears a Who! 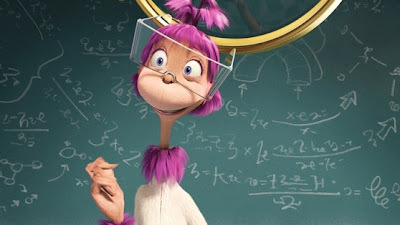 From the same studio that created the family films Ice Age and Robots, Blue Sky Studios of 20th Century Fox, directors Jimmy Hayward and Steve Martino craft not only the best adaptation of Dr. Seuss brought to screen thus far but also the best family film of 2008 as of this review. For years, I’ve been wondering if I was simply growing too impatient with animated features, having found myself bored by critical smashes such as the overly long Pixar hits The Incredibles and Cars and struggling to stay awake during films such as Curious George and Bee Movie and although there’s been a few notable exceptions (Surf’s Up, Over the Hedge), I’ve found myself steering clear of animation. However, it wasn’t until I saw Horton Hears a Who that I fell back in love with the concept of bright, magical animated family films that manage to blend positive messages with high flying entertainment and quality humor that gave at least this viewer the same kind of amazing theatrical experience that I had while seeing Finding Nemo or the Toy Story films years earlier. While on one hand, the film, like several animated works filled with A list stars for better or worse (which take jobs away from voice-over actors), has a boast worthy roster that comprise a comedic dream team in the form of not only Carrey but also Steve Carell, the legendary Carol Burnett, Seth Rogen, Will Arnett, Amy Poehler and Isla Fisher, I found myself forgetting the magnitude of the stars after only a few lines by each were uttered as admirably they began to ham less and instead preferably stick with telling the terrific tale. For those who, like myself, barely remember the book, I’ll bring you up to speed—moments into the film we meet our unlikely elephant hero Horton who hears a noise coming from a tiny speck on a clover flower, only to discover that he’s listening to residents of the tiny universe Whoville or more accurately, the mayor of Whoville (Steve Carell). Eventually concluding that “a person’s a person, no matter how small,” Horton tries to save Whoville by bringing the flower to a place where it will be protected from outside forces such as the disbelieving kangaroo (Carol Burnett) who feels Horton is becoming a dangerous agitator that must be stopped and hires the Russian vulture Vlad (Will Arnett) to do just that. 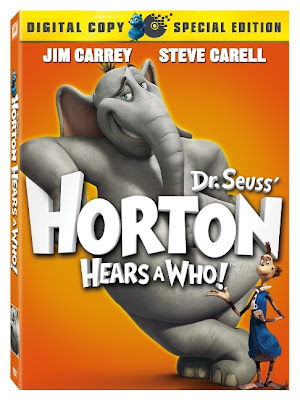 Touching, beautifully animated, fast-paced (refreshingly just 88 minutes) and undeniably heroic, Horton Hears a Who is the type of film that will entertain adults just as much, if not more than children as I found myself laughing frequently throughout by the increasingly wild situations and characterizations by the cast. Note: The book, which was published in 1954 sent some readers and journalists looking at Seuss’ work as a political allegory and in a fascinating sidebar “Who are the Whos?” by Entertainment Weekly’s Adam Markovitz (3/21/08, p. 42) he chronicles three takes on the work, including the two likeliest which saw it as first a look at postwar Japan (which Seuss has admitted) and secondly as yet another 1950’s artistic offering that echoed the political climate of America during the devastating McCarthy hearings. Having seemed to been sent a combination of both the Single Disc and Two-Disc Special Edition of the film all included on one critical screener copy, I'm unable to dissect exactly which version I'm reviewing but wanted to deliver you the inside scoop on the bonuses included throughout. Containing an entertaining director's audio commentary with the filmmakers Jimmy Hayward and Steve Martino-- both the single and two-disc versions also boast an all-new animated Ice Age short featuring the memorable characters Sid and Scrat, which is aptly dubbed Surviving Sid. Reminiscent of vintage Warner Brothers cartoons, Surviving Sid is filled with misadventure and comical peril as little animals try to endure camp counselor Sid and while cute-- it's instantly outdone by two more memorable shorts included with animated features-- the brilliant BURN-E available on the WALL-E DVD as well as the bonus DVD Secrets of the Furious Five which came along with Kung Fu Panda. Yet, the most fascinating extras for me all surrounded the making of the film. While sometimes we're overwhelmed by insistent and phony Electronic Press Kit styled interviews filled with pompous narration and interviews that nearly seem scripted, what's apparent right from the start of these extras is just how passionately everyone involved felt about the making of Horton. Also containing deleted footage and animation screen tests (with optional introductions and commentaries), it's an amazingly inspiring all-access pass to the dedication and tireless energy of the young animators who tried to stay true to Suess' trademark drawings filled with curves, wrinkles, swirls, and the struggle they had to make the short classic book into a compelling feature that still captured the same heart and spirit of the tale. Ensuring they had the blessing of Dr. Suess' widow-- the filmmakers note that Suess had never been adapted as a feature length animated work and they discussed the trials and joys of translating the author's 2-D designs into a 3-D world, right down to certain shadings and even making their first version of the screenplay a book-like treatment with the original animation in tact when they made their presentation to the Suess family. Once they received the go-ahead to make the film, Blue Sky developed a critical style guide and complete set of rules for everyone involved to follow as they point out the various Suess qualities that animators had to reproduce faithfully. And while it's a riot to watch the all-star cast record their scenes, which then sends the animators back to the storyboard panels to re-imagine and invent the animation yet again-- going as far as to literally act out the scenes themselves in front of computer cameras, just lip-syncing to the actors to get their movements, it's even more intriguing to watch the brainy, young animators themselves. Agonizing over different reads and styles of relaying a thought or action with varying body language by bringing in other colleagues to do an alternate "read" of their scene, one reveals they shoot twenty minutes of live video, then edit it until they have a usable tiny amount they animate to fit the right emotional core of the scene and stay faithful to the actor's voice work. And thankfully, they note that some of the actors allowed themselves to be filmed while they were in-house doing their voice-work, and the artists noted that they'd take some strange visual cues or movements possessed by cast-mates such as Steve Carrell, Will Arnett, and Amy Poehler and incorporate it directly into the drawings. Horton also offers a treasure trove of features from elephant fun facts, interviewing kids about how the smallest of actions can help promote a more peaceful existence, to the importance of being open-minded and without judgment in others with "A Person is a Person: A Universal Message," along with games and cast interviews. 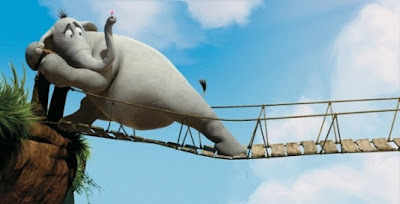 Additionally, saving the best for last-- there is some terrific footage of Jim Carrey as he relishes in completing his first CG cartoon and what drew him to the part of Horton-- the innocent elephant and it's humbling and admirable to witness his own anxieties and perfectionism in wanting it to be a success. Moreover, it's a wonderful addition to an already superior year of animated DVDs and Blu-rays, along with the recent releases of Panda, WALL-E, Tinker Bell, Sleeping Beauty, and others. Also available as a special gift set with a Horton plush toy available this coming Tuesday right in time for holiday shopping-- no matter which version of Horton you pick up, the result is anything but "small" as it's sure to become a modern, childhood favorite. Moreover, it's a highly recommended, life-affirming, positive, and inspiring film. And it's truly exciting to anticipate what Blue Sky and the other first-rate animation studios will release next to a world that desperately needs to be reminded right now that we're more alike than one thinks and in this time of conflict (as opposed to the brilliant yet bleak last forty-five minutes of WALL-E) that there's always hope if we band together. So clean out those ears, pick up a flower, and get ready to listen to some Whos.